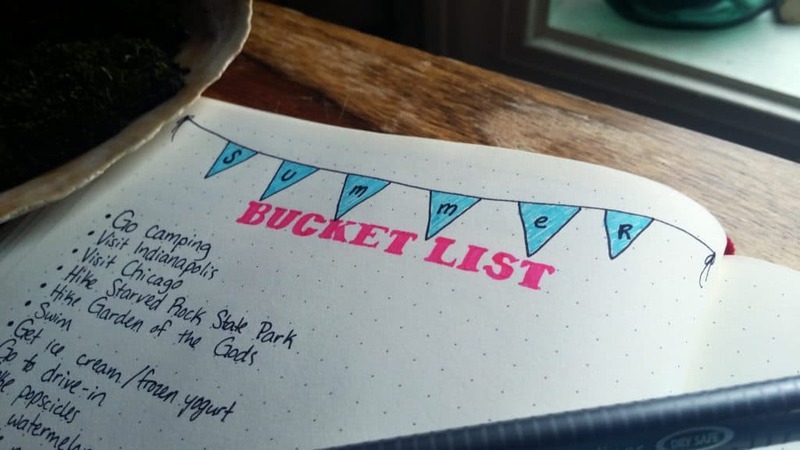 Every spring I create a list of all the fun stuff I want to do over the summer. And every summer, I only accomplish a quarter of my list, if that. It’s the curse of sheer laziness that was placed on me by an evil fairy when I was a child. When given unstructured free time, I usually squander it by laying in a dark room flipping through my phone mindlessly. But not this year! With the bullet journal, I have been so much better about using my free time to do fun or productive activities. I believe that I will knock this summer’s laziness on it’s nose! I want to really absorb the feeling of summer this year and embrace my inner child. Because that’s what summer’s all about, isn’t it? To a child, summer is the epitome of freedom. There are no responsibilities, no school, just free unstructured play. And when you’re a teenager, it means being wild and romantic or running around late at night with your besties. As an adult, there are more awesome things that I can do in the summertime (can I hear sangria by a fire? ), but mostly I just want to capture that ever-out-of-reach nostalgia. So how do you set it up? Easy! All you need to do is write it down in a list form and then reference back to that list when deciding what to do next weekend. You could decorate it a little to give it that fun sunny vibe, like it did with my Staedtler Triplus Fineliners. 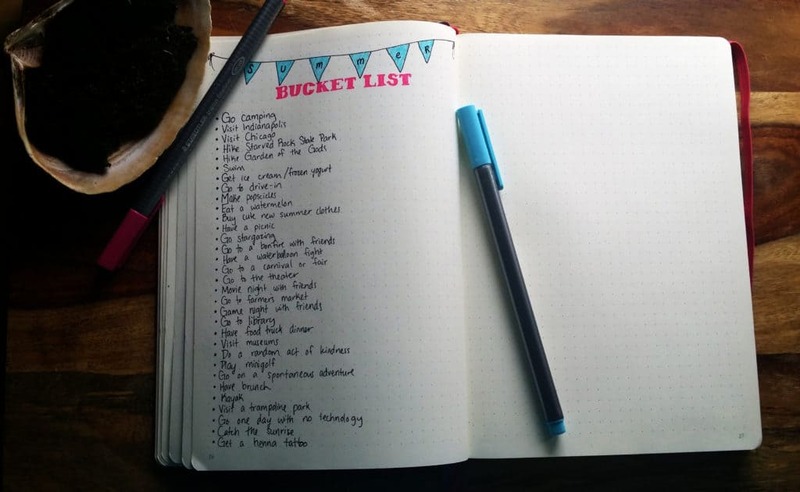 If Jon or I start to get that lazy I-don’t-want-to-put-on-pants feeling, I’ll just whip out my handy dandy Leuchtturm and flip to my bucket list. We shouldn’t go more than a week without doing some fun summer activity, no matter how small. Both of us have such a habit of saying “we’ll do it next weekend”, and I say nay this year! We will do it this weekend! You might be asking what happens if we want a quiet lazy day? I have no problem with being lazy. That’s part of the point of summer after all! But instead of being struck with laziness, I will just have to plan for it. I just don’t want to be caught being lazy because I couldn’t think of anything to do. This list will be a constant reminder of all the amazing fun things that we can do, so no excuses! In April, we wanted to go hiking for the first time with our puppy, Summer (can you tell we really dig this season?). But we realized that we only had two leash sizes: 4 ft and 30 ft. We looked at Walmart for 10 ft leashes with no luck. So that night we ordered one on Amazon and received it on Friday, the day before we went hiking, and it was perfect! Having Prime will hopefully help keep us away from the excuse of “we don’t have X so we can’t do Y.” I’m sure over the next few months, there will be all kinds of things we want to get for summer fun, and Prime will make sure we get it quickly. Summer is short, we don’t have time to wait around for 10-15 business days! If you want to give it a try, there is a 30 day free trial or 6 month free trial for students that you can cancel any time. That’s a big chunk of the summer, so there’s nothing to lose! You will love having that dependability so you can be free and spontaneous. You could leave it at just a list, but I’m going to take it a step farther and make it into a tracker. As we complete activities, I’m going to fill in a box next to each item for every time we do that activity so when the summer is finished and the leaves turn orange, I can look back and smile at the wonderful full summer we had. I want to rock this summer! What are your plans for the summer? 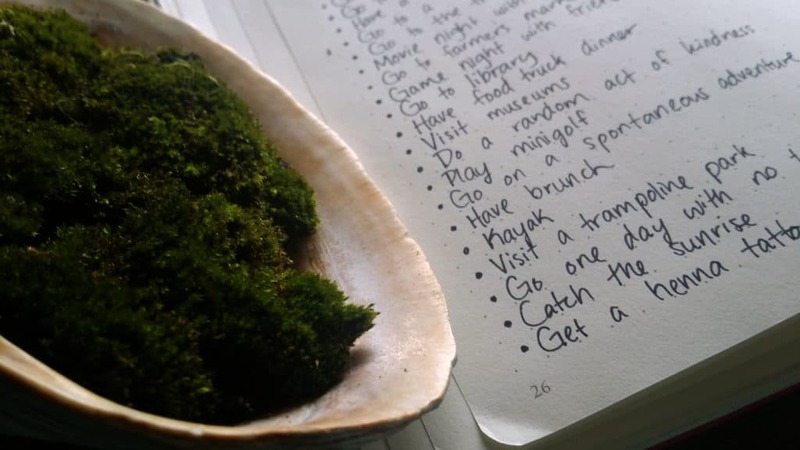 Do you like making lists of fun activities or do you prefer to be spontaneous? What are your favorite summer activities? How do you use the bullet journal for the season? Comment below! Check out my Autumn Bucket List to see what awesome things you can do in the fall! Hi Shelby! This is such a wonderful idea. I’m going to work on this today. 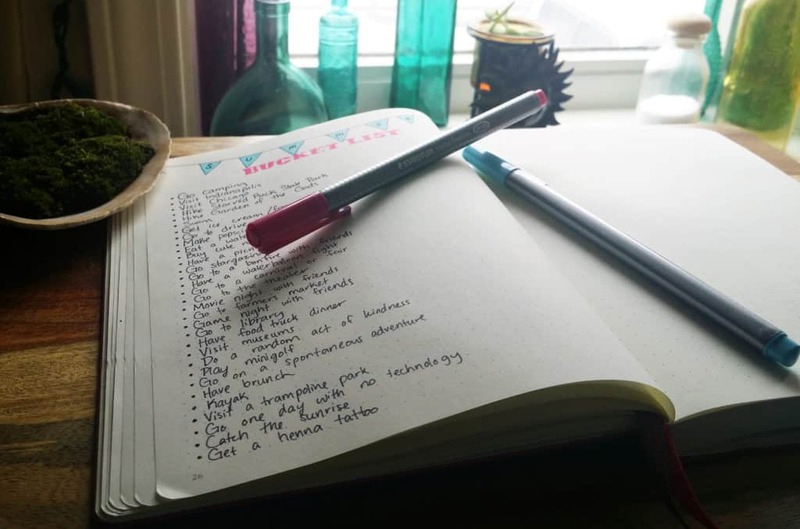 There are are quite a few things I want to do and having a list is going to give me the push I need. It’s really funny, there are 2 new stores in our town I have never been in, a beautiful huge library I’ve never been in and have no idea what all they have to offer, I would love to go to brunch, farmers market, garage sales. I’m going make a list a check them off as I do them. I have that exact same problem, Vicki! There are so many interesting things to do for cheap or free around me, but I always put it off. I want to finally start knocking those off my list and experiencing the joys of my town. Have fun checking those wonderful things off your list! 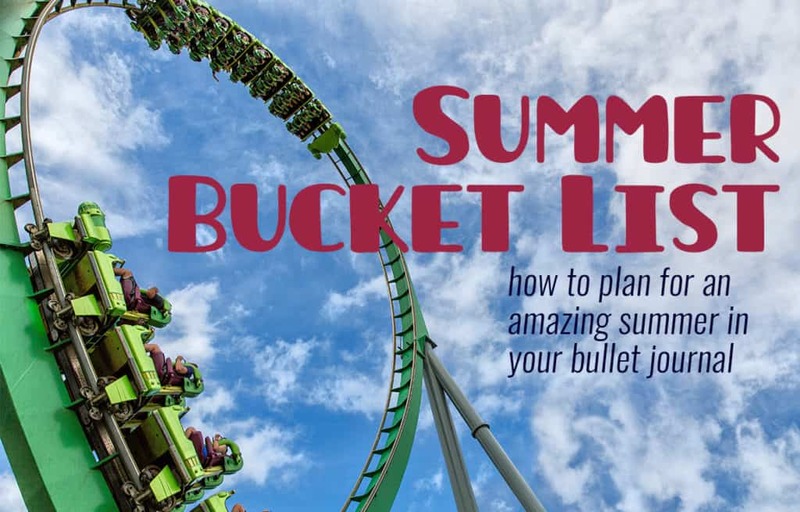 A summer bucket list is an excellent idea. I will be making one right now. I also wanted to let you know that you inspired me to buy my first bullet journal. I wish mine were as fancy as yours when I write, but it’s not. Anyways, thanks for all the ideas. I love them. Thank you so much! I’m so glad to hear that. Don’t worry, if you stick with it and practice I have no doubt that your journal can be absolutely beautiful!